CAPE CORAL, Fla. - The Christmas holiday is almost over, but truly giving is year-round. That's what one Cape Coral boy wants you to know. 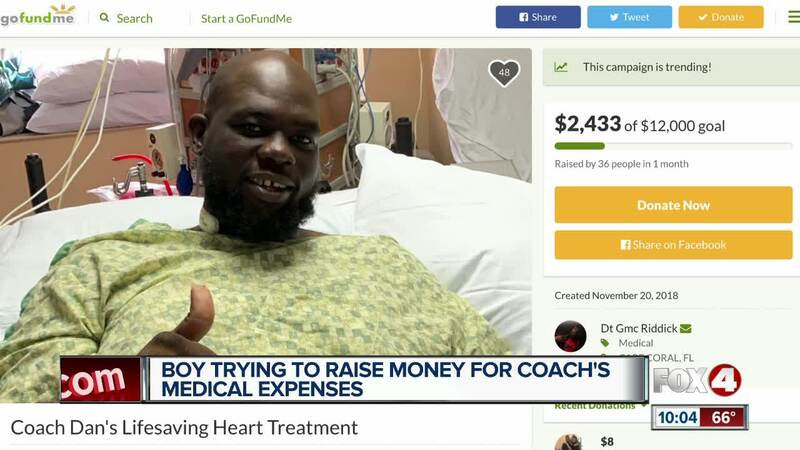 He loves football, and he loves his football coach - who was recently given six months to live. Coach Dan is Thomas Murphy's coach, and is a part of the Lee County Hawks' football organization. Thomas says his coach always gets him excited about playing. “He’s like the hype man…he’ll get you up…he’ll get you so happy", Thomas said. After a heart attack, and a couple stints in the hospital, Dan was diagnosed with CHF Congestive Heart Failure...and he was given six months to live. He says that he has options, including a device that helps vessels pump blood and a heart transplant. But, he needs $12,000 for those. Money, Thomas says, his coach shouldn't have to worry about getting. “No one should have money put on their life to determine if they’ll live or not." The team's raised money through car washes, and the sharing of his Go Fund Me page . “Even when they told them he had six months to live, he still maintained to come out on the field, hype us up, and he still had a smile on his face”. That's why the Murphy family says they won't give up on supporting him.